I remember seeing the dancing northern lights fairly often as a child growing up in North Dakota, but viewing them as an adult in Idaho hasn’t happened as frequently. The times when we stood outside in the back yard to view the Idaho version of the auroras really stand out in my memory. Shivering, but too fascinated by the glorious colors to go into the warm house…feeling every bit as much amazement as I did when I was a kid. That feeling had to go onto canvas! 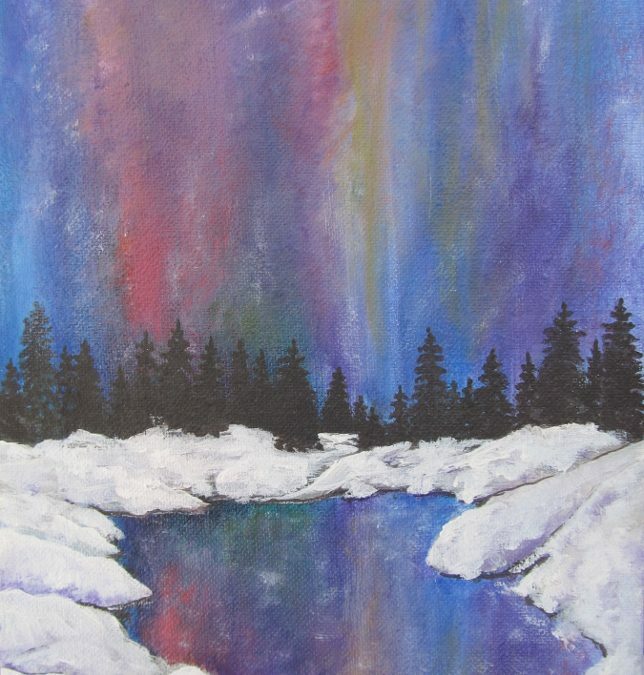 Theresa, I love your paintings, The Northern Light I had not seen and I like that very much. This is every bit as colorful and awesome as Nature painted for us in N.Dak, Theresa. I don’t remember seeing this one before; is it new? Lovely piece. I have only seen the northern lights once. Thanks for the pleasure of viewing them on canvas. Xo kim f.